Right now, there’s a lot of confusion surrounding food– whether it’s gluten, dairy, eggs, meat, or fat. For so long, we’ve relied on companies, and even the government (anyone else grow up with the food pyramid? ), to tell us what to eat and how much of that food to consume. Instead of taking a look at the food on store shelves, and the issues associated consuming food that’s not properly raised or even made with real ingredients, companies would rather distract us with food trends: calorie counting, buying new gluten-free or organic versions of the same processed food, or purchasing (synthetic) chemical-laden nut and soy milks. Back in the day, people ate a variety of diverse food. Food that came from good soil and/or was raised as nature intended. Food that often came from backyards, local farms, shops, and butchers. With basic ingredients, which were oftentimes based on the seasons and location, meals were created. I truly believe we need to get back to the basics, but it’s often hard to do this when we’re surrounded by the “noise” of so many “food” options and marketing. I’m not suggesting that we give up shopping at Costco, purchase a dairy cow, and grow all of our own food. Friend, for most of us, that’s not a reasonable plan. What I am suggesting is that we look at the food we consume, and be intentional and informed about what we’re putting in our bodies. Let’s get back to real ingredients that nourish and satisfy. So how do we know what’s actually real and what’s not? It’s easy to determine this when you’re comparing an apple and a box of Cherrios. The Cherrios win, right?! I’m just kidding. I wanted to make sure you were still with me ;). But how do you determine the real option when you’re looking at something like milk, cheese, and butter? 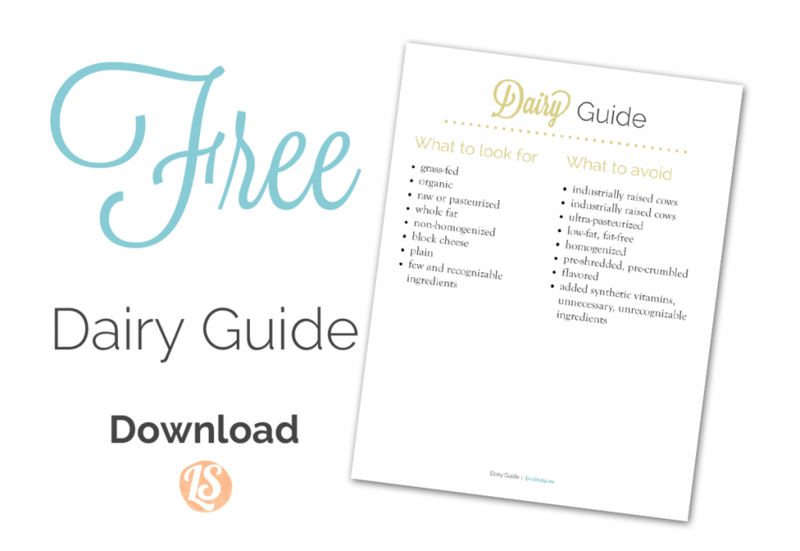 Today, my goal is to help you find “real food dairy.” This guide is based on my research over the years (reading books and talking to local farmers) and, therefore, my criteria for determining if a dairy product will make it into my shopping cart. 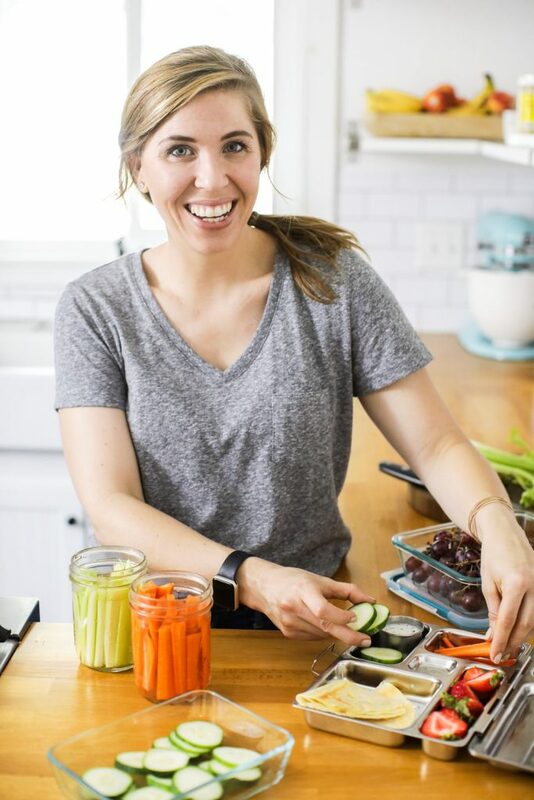 After our chat, I hope you’ll walk away feeling confident about purchasing quality dairy products, because dairy can be a wonderful, natural, and nutrient-rich food. In order for cows (or any other animal) to produce quality milk, which is then turned into cheese, butter, cream cheese, yogurt, kefir, and sour cream, the animal must enjoy a high quality, natural (meaning what it was designed to eat) diet. That is at the heart of the milk issue–it all starts in the field with the cow and its food. Cows are herbivores who need ample space to roam and graze on grass. Grass should be a cow’s main food source. As any nursing mama knows, producing milk is a full-time job–a job that requires lots of energy and food. In order to maintain a cow’s energy, a farmer may supplement with grains. This is similar to how we may supplement our diets with a multi-vitamin. Our diet isn’t compromised entirely of this pill; it’s just one little part of our main diet. For the majority of the dairy cows in the United States, a diet of grains (along with corn and soy) isn’t a supplement, it’s their main adult diet. Grain-fed cows produce more milk, gain weight at a faster rate, and produce a more consistent product. Cows that consume corn, soy, and grain as a main diet, also produce lower quality milk. The increase in milk production that comes from this diet can also mean the cows are more likely to face infections. Infections = more antibiotics. The following list includes what I look for when purchasing milk and milk-based products (cheese, sour cream, cream cheese, butter, yogurt, kefir). You’ll see that some of these aren’t “set in stone.” Ultimately, getting to know the source of your dairy (the company or the farmer) is important. Cows raised on grass/pasture–where they can roam and graze–produce milk containing beneficial nutrients: healthy omega-3’s, CLA (a beneficial fatty acid), good bacteria, and fat-soluble vitamins. And when the milk is produced in a clean environment and then bottled (or used to make other dairy products) in a way that maintains its integrity, the end is nutrient-rich dairy. Grass-fed is the first thing I look for when sourcing dairy. Last week, while I was shopping at the farmer’s market, I overheard a woman ask a farmer, “Is your produce organic?” The farmer explained that his produce isn’t certified organic, but he uses all organic practices. Since he isn’t certified organic (which is a long and very pricey process for a small, start-up farm), he can’t make any claims. I mention this because seeing the certified organic seal on a carton isn’t always a green or red light situation. If I’m purchasing dairy from a local source, I can ask about their specific practices–how they treat the grass/pasture (fertilizers and pesticides used), how they supplement, how they treat a sick animal, etc. Bigger companies, found in large grocery stores, are usually more established and have the financial means to pay for the certification process. And since I can’t visit the farm and talk directly to the farmer (although I can call the company), the organic certification means there’s some accountability in place. The certified organic seal simply means the cows weren’t treated with antibiotics and hormones. This also means the cows’ diets were made up of 100% organic feed (no GMO feed). This seal doesn’t mean that cows were grass-fed. This is why it’s important to look or ask for grass-fed dairy. 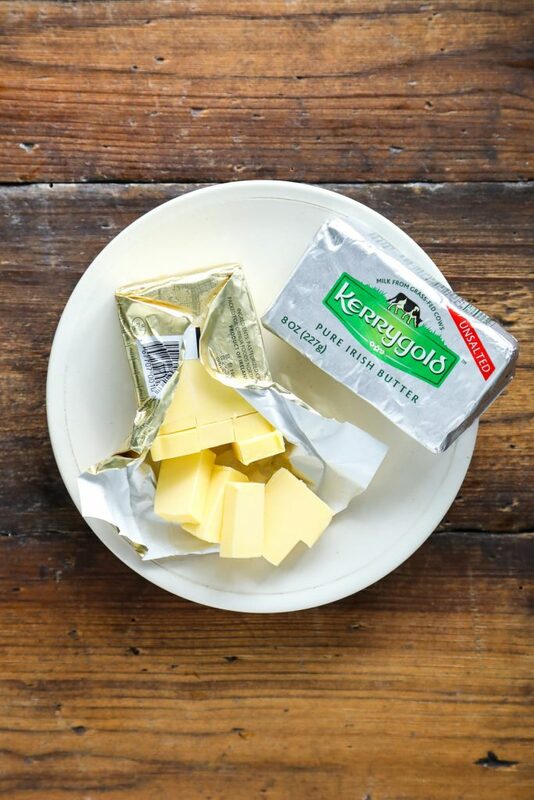 Also, keep in mind that I prefer Kerrygold Butter, which comes from Ireland. This butter isn’t certified organic (a certification from the United States Department of Agriculture), but it is grass-fed. I usually favor cheese from other countries that have higher food/animal standards than the United States (i.e. Ireland, Holland, or New Zealand), if I’m not purchasing cheese with the written labels, “organic” or “grass-fed.” Just because a dairy product doesn’t have the organic seal doesn’t mean it’s not quality dairy. From a nutrient standpoint, raw milk is my preference if it comes from a clean local farm that uses the best practices–pastured/grass-fed cows, clean milking stations, and regular testing of the milk. Raw milk maintains all of its original nutrients since it isn’t heated or homogenized. Raw milk is controversial, so it’s not something everyone wants to consume or can consume (due to laws in various states that prohibit sales). Even if you can’t find raw milk in your area, raw cheese is generally easier to find since many stores, like Whole Foods and even Trader Joe’s, sell raw cheese. Raw cheese has a rich flavor and retains its nutritional benefits and enzymes, which help the body digest dairy. 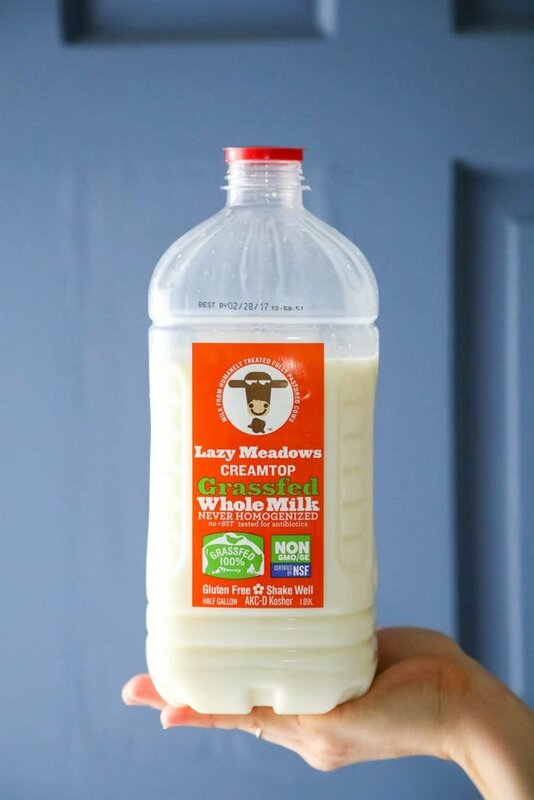 If raw milk isn’t available, then the next best option is pasteurized milk from grass-fed cows. Pasteurization (milk is heated between 145-160°F) does kill some of the nutrients in milk and specific bacteria, but this pasteurization is nothing like its cousin, ultra-pasteurization (milk is heated to 280°F and kills just about everything). Dairy that’s been ultra-pasteurized is clearly labeled this way. As a general rule, when you see the words low-fat or fat-free on a food package, there’s a good chance the product has been highly processed and many times junk has been added to make up for the missing fat. The local raw milk farmer in our area offers skim milk as well as whole milk. When I asked him about this, he said this simply means they remove the natural cream line from the top of the milk. This is a natural way to consume skim milk. But as a general rule, I avoid dairy products, including yogurt, cheese, sour cream, cottage cheese, and cream cheese that advertise the food as low-fat or fat-free. For me, Siggi’s brand yogurt and kefir-life drinks are an example of an exception to this rule since it can be hard to find their full-fat options. In its natural state, milk will separate with a cream line appearing on top of the milk. The process of homogenization breaks up the fat molecules in milk so this natural separation doesn’t occur. This is done for more aesthetic purposes, but it may cause the fat to oxidize. I personally believe it’s just one more way to overly process milk, and so I avoid homogenized milk. There are some companies, like Trickling Farms, that sell grass-fed and organic milk, but use homogenization to appeal to consumers–so there are mixed beliefs about this process, even in the grass-fed dairy industry. I prefer to purchase cheese in block (or whole) form versus cheese that’s pre-shredded or pre-crumbled. Cheese naturally clumps together once it’s been shredded or crumbled. To prevent this, companies use anti-caking agents (cellulose). Cellulose is made from wood pulp, which isn’t something that’s easy to digest. Plus, purchasing cheese in block or whole form, is much cheaper than purchasing pre-shredded/pre-crumbled cheese. Milk is naturally a plain food, meaning it doesn’t come in various flavors. In order to achieve flavoring, like strawberry, chocolate, or french vanilla, flavorings need to be added. These flavoring can be achieved naturally, but that’s not the route most food companies take. Plus, even if the flavorings are natural, sugar is usually added to enhance the flavor. This applies to milk, kefir, and yogurt. In general, go with the plain option, and add your own flavoring, if desired–make chocolate syrup or strawberry syrup, stir in some frozen or fresh fruit, or add a bit of honey or vanilla. There are times when I’ll purchase flavored yogurt as a treat. When doing this, I always read the ingredient list and check out the sugar content on the nutritional label. As a general rule, the sugar shouldn’t be much higher than the protein. Finally, milk and milk products (cheese, cottage cheese, yogurt, kefir, sour cream, cream cheese, butter), should contain just that, milk, as the first ingredient. And if you’re purchasing milk itself, milk should be the only ingredient. 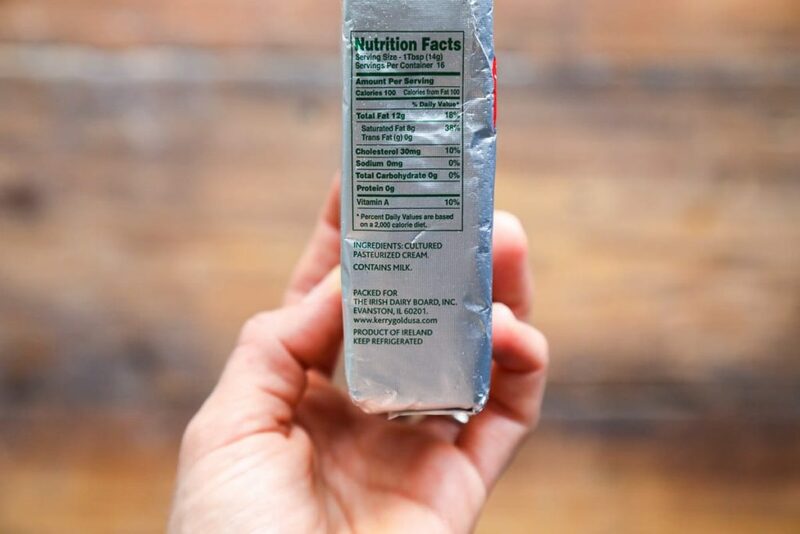 If you’re feeling good about a milk or milk product selection, flip it over and read the ingredient list. The ingredient list should be short, easy to read, and include recognizable and appropriate ingredients (i.e. cultures in yogurt). 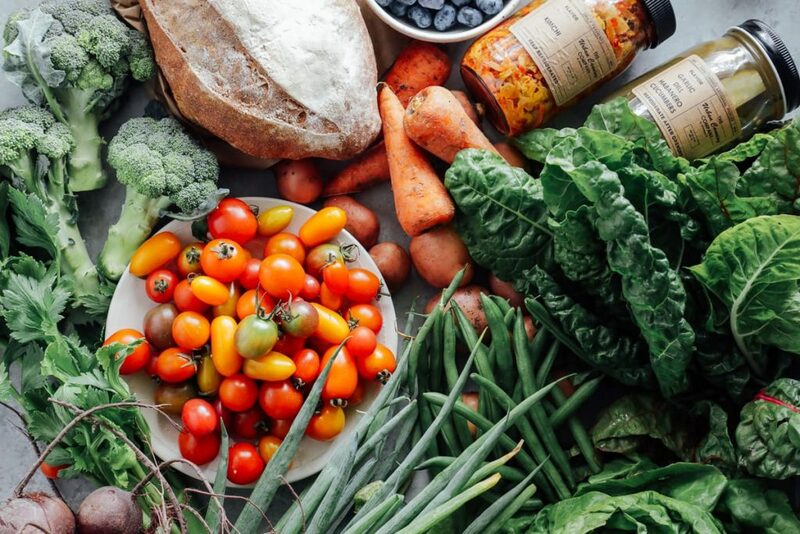 If you’re purchasing from a local farm, there probably won’t be an ingredient list, so talk to the farmer. When I first started looking for quality dairy, almost six years ago, I was startled by the lack of options in grocery stores. I started reaching out to local raw milk farmers. I’ll admit, at first I was incredibly scared to try “fresh from the cow” dairy. Once I got over my fear, I discovered that I had been missing out. The dairy I consumed as a child had a taste and consistency similar to water. The raw, grass-fed dairy was rich, creamy, and flavorful. For many years, we continued to purchase and consume raw dairy products from the same local farm. Today, it’s hard for me to make the raw milk pick-up time, so I’ve started purchasing more dairy from the grocery store. 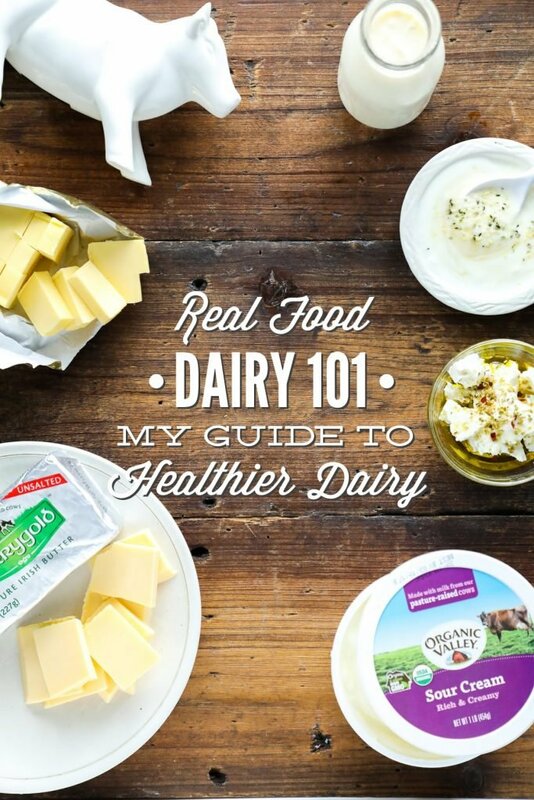 I’ve found that a lot has changed when it comes to finding quality dairy–it’s much easier to find real food options. I share this story to encourage you. Whether you have a local dairy source or you need to visit a store, it is possible to find real food dairy options. Look in your local area via a farmer’s market (where local farms gather and sell goods) or Eatwild.com. Ask about the farm’s practices, and even visit the farm before purchasing goods. As I mentioned, I’ve been able to source raw milk, cottage cheese, sour cream, and cream via a local farm in our area. Local health food stores and Whole Foods are another great source. 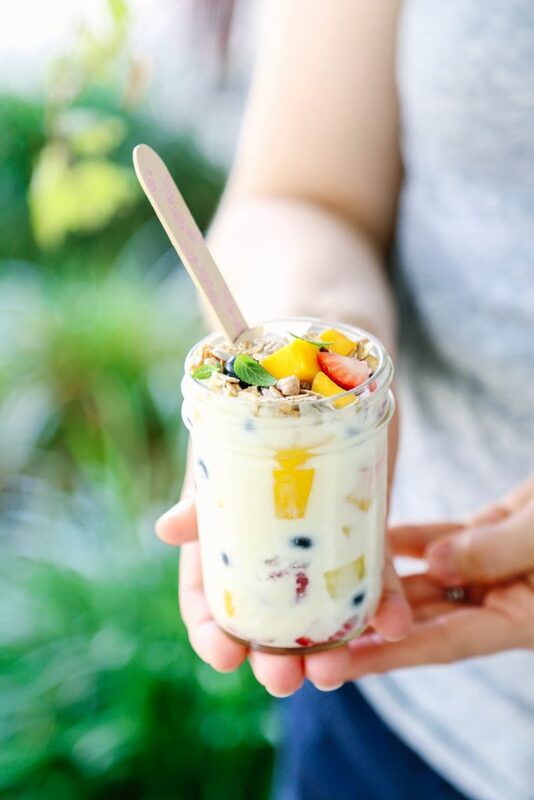 You’ll still find lots of ultra-pasteurized milk, flavored yogurts, and pre-shredded bags of cheese, but in the midst of these products you’ll also find dairy treasures. I like these brands: Stonyfield (yogurt), Lazy Meadows (not certified organic; milk and heavy cream), Organic Valley (Grassmilk milk, Grassmilk yogurt, cheese, cream cheese, sour cream, butter), Natural By Nature (milk, heavy cream), Kerrygold (butter and cheese), Trickling Farms (milk and cheese), Nancy’s (cream cheese and yogurt), Brown Cow (yogurt), Seven Stars (yogurt), Maple Hill Creamy (cheese, yogurt, and kefir), and Siggis (yogurt and a kefir-like drink). Some health food stores also carry local dairy options. 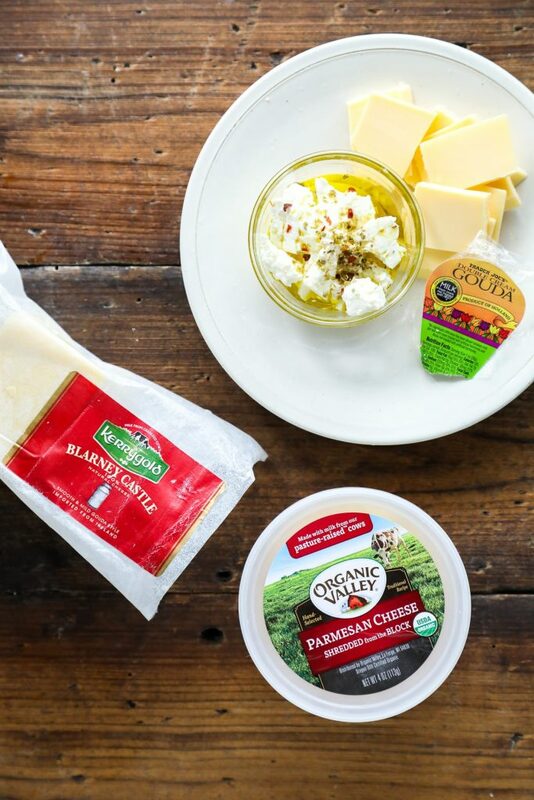 Most conventional stores don’t sell quality milk options, but many do sell good options for cheese, sour cream, cottage cheese, butter, and cream cheese. Organic Valley, Kerrygold, and Stonyfield are common brands found in some conventional stores. Also, Daisy is a conventional brand of sour cream with a very minimal ingredient list. Trader Joe’s makes a great whole milk grass-fed plain yogurt. Trader Joe’s also has a great cheese department. If you want to experiment with do-it-yourself dairy products, you can easily make yogurt and kefir at home using quality milk. You can also make coffee creamer using milk and cream. Not everyone may be able to or want to consume dairy products–that’s a personal choice. For my family, we choose to consume the highest quality, minimally-processed dairy products available to us. Remember, a real food lifestyle is about being intentional and doing the best you can. If you’re not able to consume dairy, or just want to add a bit of variety to your diet, you can try making your own nut milk (cashew milk or almond milk). There are a few companies making nut-based, non-dairy products with good ingredients, such as: New Barn, Kite Hill, Tree Line Cheese, and Forager. You’re doing an awesome job. The birth of our first child was when we became very conscientious about food choices, too! I’m so glad this post was helpful! Sourcing quality dairy can be really expensive. I’ve found that we’ve had to cut back on our consumption of it, or just be really intentional about how we use it, due to price. From a budget standpoint, there are many times when I’ll forgo organic produce so we can budget for quality dairy selections. I figure produce can be washed, but dairy (and meat) can’t. Also, This Organic Girl (http://thisorganicgirl.com/) is a fellow friend and blogger. Lisa lives in Atlanta (and she’s very friendly). I bet if you reach out to her, she might have some recommendations for farmers in the area? Well, you are amazing! Thank you so much! I’ll poke around your friend’s site, for sure, and if I get brave – or more likely, desperate! – I’ll reach out to her and tell ‘er you sent me! This post is exactly what I have been looking for! I do have one question though. I buy local, non-homogenized, pasteurized, whole milk. The label also says, “vitamin d fortified” What exactly does this mean? Hey Julie, I’m so glad it was helpful. This usually means they add vitamin D to the milk–which is usually done to help absorb calcium. For me, this would be one of the cases where all the good characteristics outweigh the one added ingredient. If you can, I would reach out to the farm/brand/company and ask why they add it. I’ve found that most local, smaller brands are happy to provide information about their practices. There’s a local brand in our area that does this as well. Thanks for your blog. It has become an incredible resource for me — love your recipes. 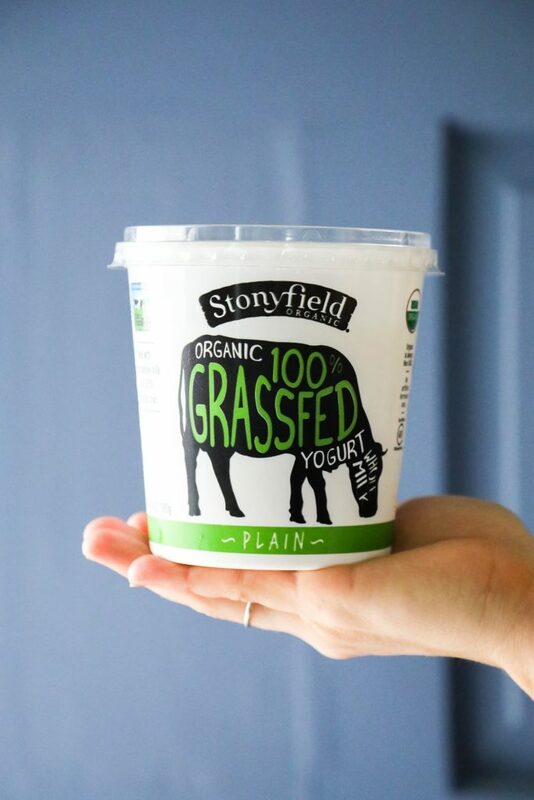 Do you know whether the Stonyfield yogurt claim is that the yogurt is made (1) 100% from grass-fed cows (i.e., exclusively from cows that were fed grass — although perhaps not feed only grass) or (2) made with milk from cows that are 100% grass fed (i.e., the cows that produced the milk consumed only grass)? I looked online to better understand the claim and It’s unclear to me from the website. Any help is appreciated! Thank you, Tia! I’m so glad you’re enjoying the blog! I just talked to Stonyfield to verify the answer and they said the yogurt is exclusively from 100% grass-fed cows, so they don’t receive any supplemental feed. They ferment the grass, so in the winter that’s how the cows are able to continue enjoying a grass diet. They said this is only true for their 100% grass-fed products, not their other products. The 100% grass-fed products are PCO Certified, which is a watch-dog kind of group for such claims. Thanks! This is great to know. I will be sure to look for this line of products. I’m glad it was helpful, Tia! Thanks for another great blog!!!! Wow, that’s amazing Mihela! What an awesome experience. Even our local market vendors wrap their cheese in plastic :(. Some brands–I’ve seen them at Whole Foods– sell cheese wrapped in wax coverings. I only know of one brand for the beeswax clothes: https://www.beeswrap.com/. It’s actually on my to-do list to try making something like this! That’s really scary, Shannon! I would be hesitant to purchase the milk again, too. Do you know if the farmer tests the milk? I think Whole Foods should have some good options that aren’t ultra-pasteurized. In the end, we can only do the best we can and choose the best available options. Something like coconut milk might work as a temporary sub, or even a nut milk? Love this post! Ironically we have a few of these brands in our fridge right now… my first time trying them, but fun to see that you give them a thumbs up 🙂 Side note: I even got to try a few of them for free because they were close to expiration. Win win! Yay, Tierney! I’m so glad the post was helpful. That’s so awesome about the free products! What are your recommendations for the cost issue? On a tight budget as a stay at home mom, I cannot afford to shop at Whole Foods or other health food stores. Do you find the farmers markets more cost effective? I look for ways to the reduce cost in certain areas of the grocery budget to prioritize buying good dairy and meat. For example: I’ll shop conventional produce from a market or produce stand or ALDI (much cheaper than a store or Whole Foods, etc.) and then use the savings from that to purchase good dairy and meat from a health food store or Whole Foods (since it’s usually easier to find these options at these places, but many conventional stores now sell Kerrygold, Organic Valley, and Stonyfield) or a farm, or market. 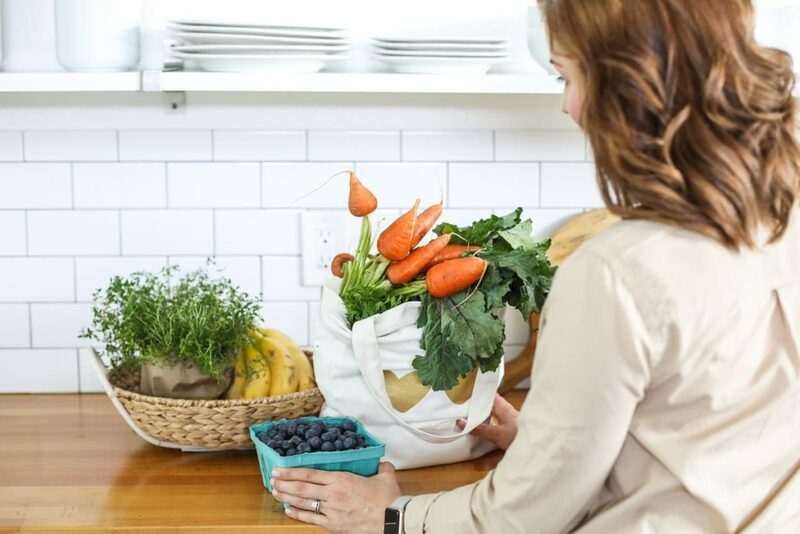 Getting away from lots of packaged foods, and speciality foods, also has helped reduce our overall grocery budget so we can put that money towards more expensive grocery items. We also decided to cut back in a few other areas of our budget (entertainment for example) to allow for a few extra dollars a month for groceries. We also found as the kids are now older that we don’t consume milk very often (other than baking), so this helped reduce this cost and I was able to focus on the dairy products they were consuming: cheese and yogurt. In the end, I think it’s important to do the best we can (progress over perfection) and focus on consuming up food (dairy, in this case) with a clean ingredient list (no extra additives). Hope that helps! Daisy sour cream is my favorite. I don do much dairy but this sour cream makes an occasional appearance in my shopping cart.